Anti-fascists in Kyiv yesterday marked the anniversary of the assassination of two Russian activists – and faced intimidation by a neo-Nazi gang as the police stood by. 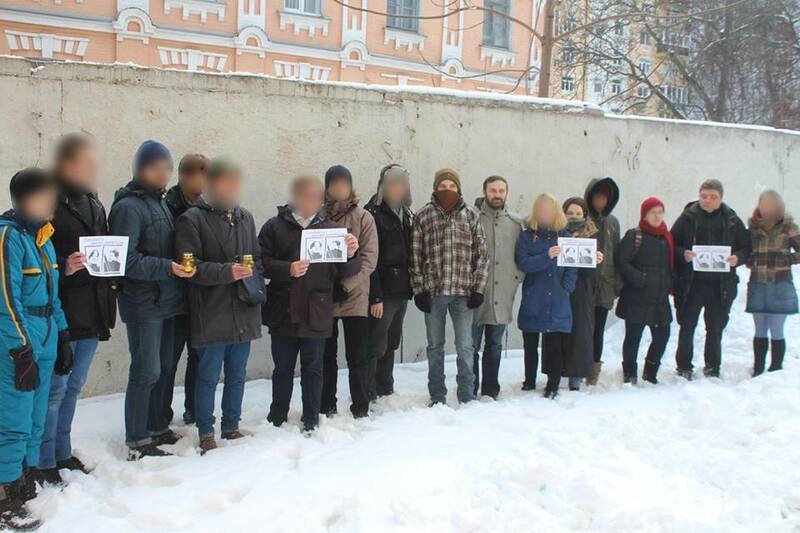 Russian and Ukrainian activists take to the streets every year to commemorate journalist Anastasia Baburova and lawyer Stanislav Markelov, who were shot dead by fascists in broad daylight on 19 January 2009 in central Moscow. in Kyiv issued threats against the demonstration in advance, and the police told organisers they could not guarantee their safety. In the end, about 15 anti-fascists demonstrated at Podol (see photo), while a similarly-sized group argued with the right wingers as journalists looked on. “[In Kyiv yesterday] representatives of the Russian section of the Azov battalion [of volunteers fighting on the Ukrainian government side in eastern Ukraine] said they see Budanov as a hero. “They then began to heap praise on the brilliant Russian army that had destroyed the ‘Chechen scum’, and on colonel Budanov personally. The apotheosis: the claim by one of the Zukhel-ites that ‘you’re against Russian people, you just love those churki’ [an extremely derogatory term for people from the Caucasus]. At this very moment, their Ukrainian brothers-in-arms from the battalion continued to curse the anti-fascists as ‘pro-Moscow separatists’. D. also recorded that the fascist assailants included Sergei Filimonov, who is active in a fascist group that works among Dinamo football supporters, and was responsible for the attack on black English fans who attended Chelsea’s recent away fixture with Dinamo. And there was a group of neo-Nazi teenagers shouting “Sieg heil” and “SS”. ■ There were anti-fascist demonstrations in most of the largest cities of Russia and Ukraine yesterday to mark the anniversary of the killing of Markelov and Baburova. The rally in Moscow was “twice as big as last year”, one participant reported. In St Petersburg, the authorities refused permission for a demonstration, but did not prevent about 200 participants from walking along the pavement. Among speakers at the St Petersburg event was the socialist activist Ivan Ovsyannikov, who said at the problem of fascism in Russia had changed its character in the seven years since the deaths of Markelov and Baburova. “While repressing particular nationalists, the state has actively taken over their rhetoric and ideology”, he said. ■ Update (Wednesday pm). 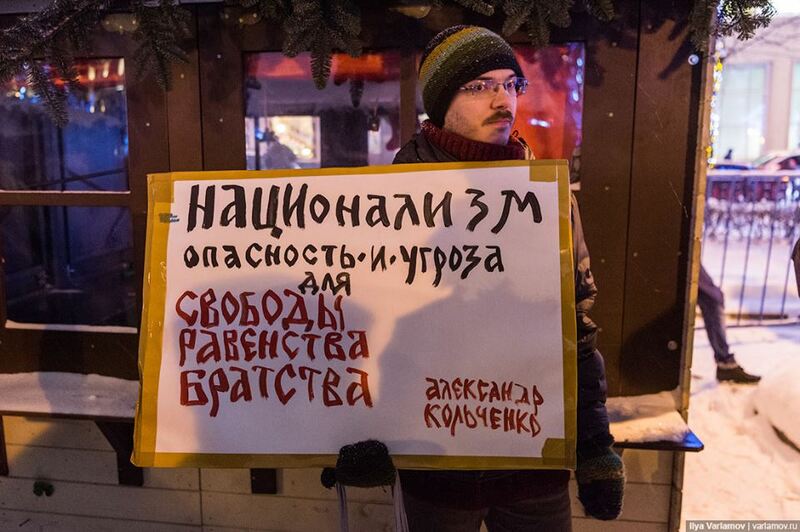 There was an impressive march in Moscow on 19 January: see pictures on social media here. 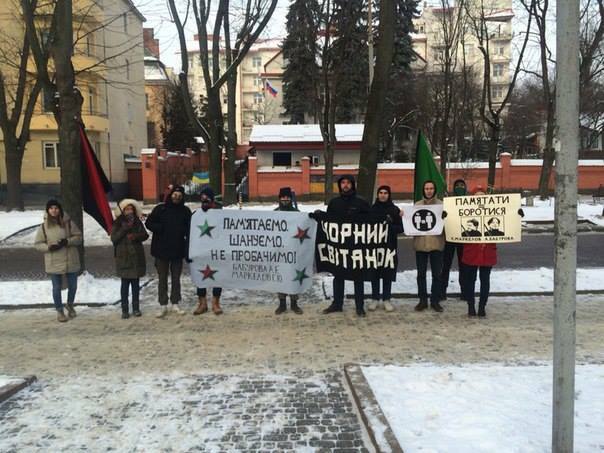 And a picket in Lviv (see picture below). Thanks to P, K and to Grits (see his comment below). ■ These reports paint a picture of a fascist dragon let loose by the Russian state, and in part superceded by the Russian state, extending its tentacles into Ukraine. This experience of Ukrainian and Russian anti-fascists deserves consideration by socialists and anti-fascists in western Europe. I have also today published a short report about some social struggles around workplace issues in eastern Ukraine, another part of the picture of the effect of war and militarism on working people. GL, 20 January 2016.